Today, Ubisoft has released 'Trials Rising Sixty-Six', the first expansion for the latest entry to the series which launched on Switch in February. After completing League 3 in the base game, players will have the opportunity to experience all that Sixty-Six has to offer, including twenty-four new tracks with two Stadium Finals and two Skill Games. Protect your rider from hard-hitting obstacles with the American Football Outfit, which features a football helmet, jersey, football pants and cleats. Also included are new Contracts and new hidden golden squirrel collectables, designed especially for the occasion. Collect them all to receive more fame. Sixty-Six is now available as a standalone purchase for £6.50 / $7.99 or as part of the Expansion Pass. The Expansion Pass includes Trials Rising Sixty-Six – Expansion I, Trials Rising Crash & Sunburn – Expansion II, the Stuntman Rider Pack, and the Samurai Item Pack. It's also worth noting that the base game is currently on offer in Europe, with a 20% discount available on the eShop. Did you pick up the Trials Rising Expansion Pass? Will you be treating yourself to this extra content today? Let us know in the comments. Is Trials playable on the Switch? Yes. 30fps and worse graphics of course. Personally had a great time with single and multiplayer modes. Perfectly playable. If you don´t know other platform versions (and their visual appearance), you won´t notice a downside. For the missing analog triggers, you habe the analog stick alternative. Thnx. I've played it on the PS4 Pro, and I loved it. I sold my PS4 Pro and bought a Switch instead. Really want to play it again but I think I won't like it on the Switch. The biggest issue for me will be the controls, because of the R2 trigger. @Cyrax77 @EasyDaRon Even if you still wanted to use analog triggers, you could use the GameCube controller. 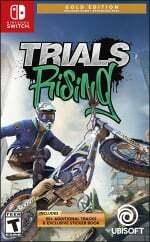 I prefer Trials Rising on Switch to previous Trials games I played on Xbox 1S. It really is fun, great music, good intuitive controls. Great, how much of it can you actually see? Just got the physical gold edition in the mail late last week. The download code wouldn't work however (constant error messages). On the bright side, Nintendo's support team got it all figured out today, and the DLC just finished downloading a few minutes ago! @Cyrax77 Pitching in as a Trials player since Trials HD. Digital gas and brake is perfectly fine, when you get used to it. I play with analog now, but for most of the games, I used the digital face buttons even though the triggers were available. When you need to "feather the gas", you can just repeatedly tap gas instead. Many top players use digital gas. The worst thing about the switch version is that I’ve experienced numerous game crashes where the game just shuts down and kicks me out to the home meny. Then there are graphical glitches to, especially during replays where whole segments of the track diappear and the rider is riding in mid air. But it’s just laughable how it can happen, nothing major or game breaking. Haven't got this one yet, need to get my money's worth from Playground first, but it's on my list, don't worry. Trials on Switch is incredible. I've got 70 hours and all the extreme tracks unlocked. Couldn't beat Inferno V though. That ones so tough. All of it. Only 1 level out of 125+ levels had that fog, as it was an intentional design choice for that one specific stage. Of course people who havent played the game and just read headlines never figured that out. Surprisingly, the analog stick is actually my preferred control method now. Using the analog shoulder buttons causes my finger to get too tired. Using the analog stick though... its fantastic. Felt a bit weird for an hour or so, then right as rain ever since. I played Trials fusion on Xbox One. For the Switch, using analog stick for throttle was very easy to adapt to, in my case. I've played up through the hard level tracks so far and analog stick throttle is great. Pushing the right analog stick to the right for throttle works really well (push left for stop/reverse). I think something is wrong with my copy. I have the physical gold edition and the expansion pass redeemed, but none of the biker gear (Samurai, American football outfit, etc) it says I get is anywhere in the game.